Yes, I’m a middle child. I was voted “Most Talkative” in year 8 while my older sister was voted “Best Looking” the year before. 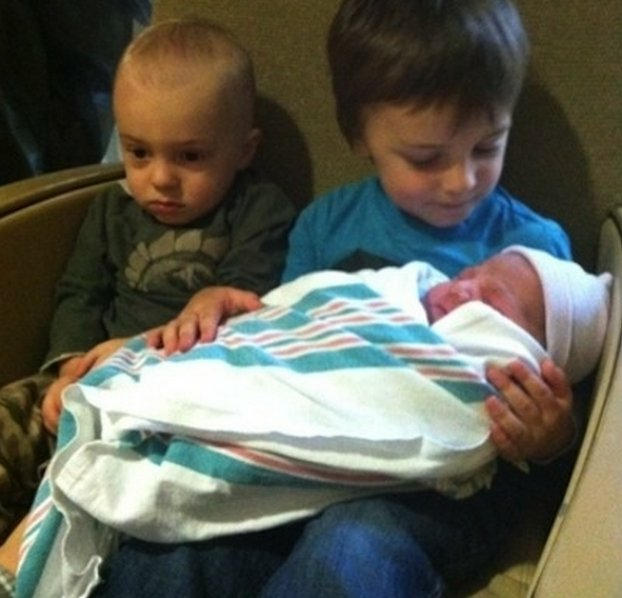 With a gorgeous older sister and an adorable younger brother (and then another adorable brother years later), is it surprising that I was always trying to be noticed? Probably not. You know what else isn’t surprising? 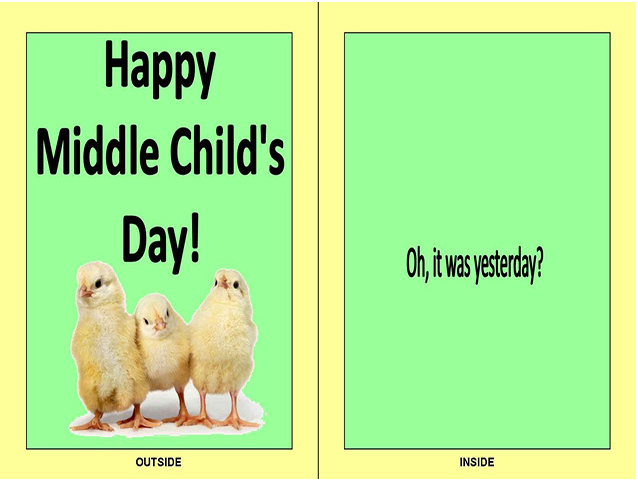 Monday was Middle Child’s Day -- and you had no idea. So typical. Bruce Hopman, the sole member of the mock-serious International Middle Child Union and the creator of “Smack Dab: A Middle Child’s Blog,” wanted middle kids all over Twitter, Facebook and other social media to post the hashtag #midkidstrike to raise awareness for this invisible holiday. "I had to do something to raise awareness for Middle Child&apos;s Day," he told the South Florida Sun Sentinel recently. "If we don&apos;t pick ourselves up, who will?" Did it trend? Of course not. Again, because middle kids had no idea that a holiday was devoted to them! The Ft. Lauderdale, Florida-based dad of three (yes, he has a middle child too!) 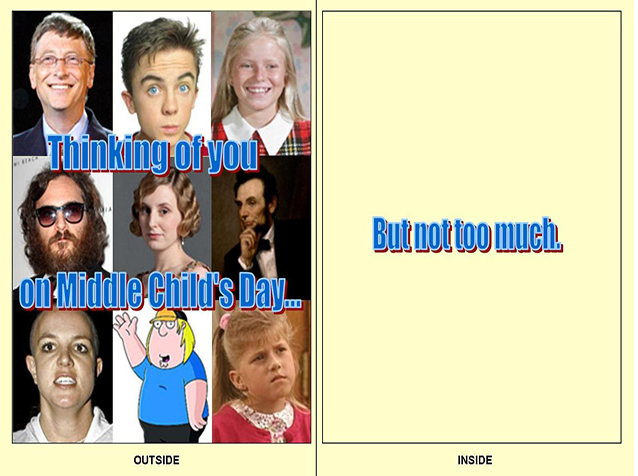 posted some genius online cards on his blog that you could’ve given to the middle child in your life. 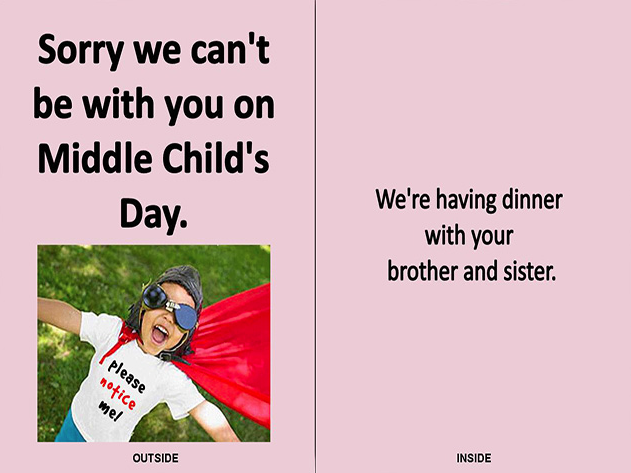 We know: You would’ve sent them to us if you knew Middle Child’s Day was a thing. Thanks anyway. There’s always next year. Serena Kappes is an Editorial Director at iVillage US and a middle child (if you care). Find her on Twitter and Pinterest.